Here is some straight talk about escalating terrorism — and what the Bible says will be done about it! A tidal wave of terrorist activity is engulfing the globe. Never before have law officials been so alarmed over the potential for widespread death and destruction at the hands of terrorists. Terrorism threatens to escalate out of control. Some experts feel that terrorism is about to become the single biggest problem facing the Western world. More and more people are going to be touched by its devastating effects in the months and years just ahead. Clearly, we are entering an age of terror! But why — amid all the media discussion of terrorism — has there been no mention of what the Bible has to say on the subject? Is the Bible relevant to the pressing problems of our 20th-century world? Or is it, as most people believe, merely an outdated volume of inspirational quotations? You need to understand the facts about this frightening specter of terrorism — and the biblically revealed solution — the only solution — to it! Why this modern-day scourge of terrorism? This world is filled with a multitude of causes, small and great , just and unjust. The prospects for success for many of these causes, however , are doubtful at best. Opposition or indifference to them is simply too overwhelming in many cases to permit the individuals and groups involved to achieve their goals. Terrorism — the use of brutal, indiscriminate violence to further a cause — is the last-resort weapon of the weak against the strong. [t is employed by individuals and organizations to publicize their causes and achieve ends that otherwise would be unattainable. Relatively powerless politically and militarily, terrorists see no other way of striking out at their enemies. Terrorism, moreover, is dramatic, spectacular violence designed both to generate fear and to gain instant worldwide recognition for a cause. Terrorist acts have an enormous emotional and political impact, out of all proportion to the actual strength of the terrorist group. By one daring act, an obscure, rag-tag band, with the help of modern mass media, can achieve notoriety far beyond its power and numbers. Compounding the problem, terrorists today are becoming more deadly than ever, with growing sophistication in weaponry and tactics. The day of the crude pipe bomb and Molotov cocktail has given way to portable missile launchers and precision explosive devices. The trend toward greater international contact and exchange of arms and expertise is enhancing terrorists' capabilities and effectiveness. Police officials are preparing for the worst. What can be done to stem the epidemic of terrorist bombings, hijackings, hostage-taking and assassinations? Experts talk of preventive measures, of retaliation and stiffer punishments for terrorists, of stepped-up intelligence activities, of strong-arm rescue operations, of curbs on the media to deny terrorists publicity. But the truth, of course, is that there are no proven and infallible human measures to absolutely protect against terrorist situations. Precautions can be taken only up to a point. Terrorists, knowing when and where and how they will strike, always have the advantage. It is virtually impossible to guard against a determined and prepared terrorist. One man, with a device made from materials bought at the nearest hardware store, can hold an entire city for ransom. A small hit squad can throw an entire country into turmoil. It is that simple. The experts agree: Anything is possible in the world of terrorism. There is no limit to the terrorist imagination. The message is clear. In this world, terrorism can never be completely stamped out. Authorities fear that terrorist groups will now feel compelled to commit acts of even greater and more dramatic violence in order to stay in the headlines. Privately, many experts are saying that they fully expect that a terrorist group will soon either steal or manufacture an atomic bomb and use it as part of some monstrous blackmail scheme. Underground pamphlets have already been uncovered in Europe containing plan s for crude atomic weapons. Escalating terrorism on a worldwide scale is inevitable! Where i s all this leading? The prospects are grim. The personal suffering of innocent victims caught up in terrorism is just part of the picture. Terrorism can — and will — have much more far-reaching and devastating ramifications. Remember, it was a blood y act of terrorism at Sarajevo that triggered World War I. And it was the Nazi campaign against alleged leftist-backed terror in Weimar Germany that helped Adolf Hitler (no stranger to terrorist tactics himself) to seize power. Terrorism presents a major threat to Western civilization. Understand this: Terrorists view chaos and anarchy as a prerequisite for the overthrow of established governments and the emergence of their various envisioned utopias. But history shows that terrorists usually succeed only in creating what they hate the most — despotism and even greater repression. Violent disorder, history reveals, is more likely to spawn tyranny than paradise. In the face of terror-generated chaos and an impending breakdown of society, frustrated and angry citizens invariably call for strong measures to re-impose order — even inviting authoritarian government and restrictions on civil liberties. Historically, freedoms have been suppressed in the name of law and order. Terrorist disruptions, in short, might well be used as an excuse by would-be strongmen to seize power and impose their ironfisted rule over nations, promising security. Few newsmen have stopped to consider the potential of such a scenario in the wake of escalating world terrorism. Bible prophecy — as regular readers of this magazine know — reveals that we are headed for a new dark age of political despotism and barbarism — on a scale unmatched in history! Rampant terrorism on the world scene will undoubtedly play its part in paving the way for prophesied end-time tyrants to assume broad "emergency" powers — as did Adolf Hitler and others through history. The scourge of terrorism was predicted centuries ago in the pages of the Bible. Jesus prophesied that conditions in the latter days would mirror the chaotic state of the earth in Noah's time — an evil and corrupt world filled with violence (Luke 17:26, Genesis 6:5, I 1). The apostle Paul also warned, "In the last days perilous times will come" (II Timothy 3:1). The meaning of this prophecy goes far beyond mere incidental crime. "Make a chain," cried the prophet Ezekiel , "for the land is filled with crimes of blood, and the city is full of violence" (Ezekiel 7:23). Bible prophecies picture an end-time world filled with lawlessness, aggression and hate, a world split by factions and international disputes, a n era of rampant, indiscriminate violence and murder inspired by Satan the devil, the original murderer (John 8:44). We are living in those very days! Man, apart from God, cannot control terrorism. As long as the evil influence of Satan remains on the earth, terrorism and crime will continue to escalate, despite man's attempts to stem it. Force will continue to rule the world. Man will continue to answer violence with violence. This is yet Satan's world (II Corinthians 4:4). Is there any way out of this madness? Is there any way to halt the violence? The vast majority of people, even professing Christians, fail to realize that the Gospel of Jesus Christ is a message about the coming restoration of God's government over this earth. Only when Satan — the ultimate terrorist — is finally restrained (Revelation 20:1-3) and God's millennia! rule is established on earth will violence be eradicated and lasting peace be realized worldwide. Man, by his own puny efforts, could never unseat Satan. Only Jesus Christ can do that — and He will! But for the moment, God is permitting this world to go its own disobedient way, to learn for itself the bitter lesson that Satan's way of rejecting the laws and government of God can in the end bring nothing but calamity. But the day is soon coming when violence will be dealt with firmly and decisively. Purveyors of death and destruction will be dealt a punishing blow. The returned Jesus Christ "shall judge between the nations, and shall rebuke many people; they shall beat their swords into plowshares, and their spears into pruning hooks; nation shall not lift up sword against nation, neither shall they learn war anymore" (Isaiah 2:4). Satan's way of vanity, jealousy, lust, hatred and greed will be replaced by God's way of loving, giving and serving. This is the only real solution to the rampant violence that is now engulfing the world. 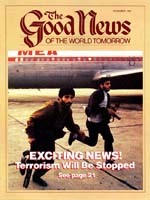 This magazine announces the good news of a coming new age, a new civilization, a new government for this earth. For a detailed look at how that government will eradicate violence, terrorism and other evils of this world, request our free publications The Wonderful World Tomorrow — What It Will Be Like and World Peace — How It Will Come. Just mail the request envelope in this issue or write to our address nearest you (See inside front cover for a list). There is good news beyond the bad news — terrorism's days are numbered!